A central training was held on the 29th of November with afterwards an exam up to sandan. Suraya was the only KKDH participant and passed with flying colours. With a pass rate of less than 43% quite an achievement. Congratulations Suraya! 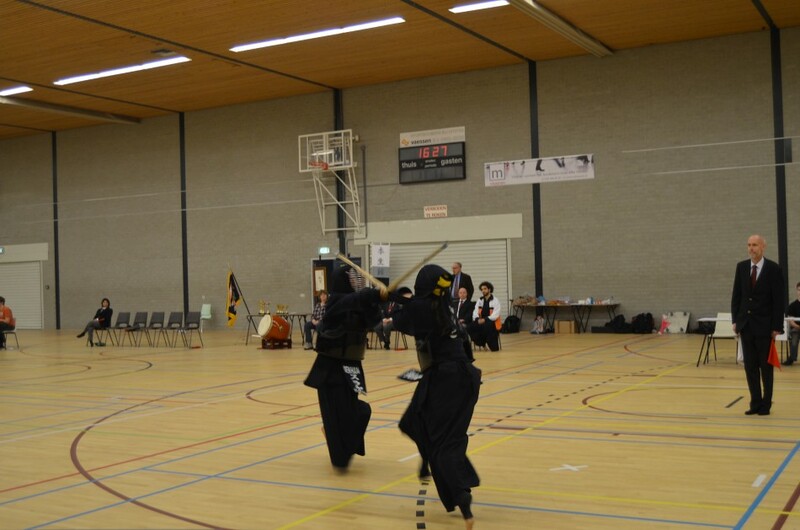 The Dutch Kendo Championship took place in Amersfoort this year and was organized by Mokuseikan. Like always we gathered in front of the dojo early in the morning in Voorburg to carpool. Yes you read it right, not only do we use biodegradable shinai, we also carpool. It must be said, Raph was actually on time but of course Sjoerd was (slightly) late. The A4 was closed down and he had pics to prove it, or so he said. After loading our gear in the cars we left for Amersfoort. After the obligatory speech from the Chairman of the NKR the youth tournament category 1 was off to a very cute start. Since there were quite a lot of kenshi enrolled in the tournament the group was split in category 1, from age 5 to 11 and category 2 age 12 and up. It was S. Saito who won her first national championship in category 1 in which no KKDH kenshi participated. In their first national championship ever, Geert and Jasper fought for everlasting fame and fortune in category 2. Jasper fought like a lion but to no avail, his opponents were too strong and he did not make it out of the preliminary round. Geert made it all the way to the finals and went on to claim his first title as Dutch National Champion in a nerve racking match. He certainly earned his nickname the ‘crimson reaper’, although we’ll just keep naming him Geert. During the ceremony afterwards Jasper was awarded the well-deserved Fighting Spirit price. A great success for both kenshi and Kendo Kai Den Haag. After the ceremony it was time for the female competitors to cross swords. That meant it was time for Suraya to compete. Would she fight well or bring shame upon the dojo in her first competition ever. She fought heroically but the odds were stacked against her favor. She was up against some really tough opponents who ultimately advanced and achieved second and third place. Suraya still had a second chance though later on that day. Fleur Smout (Fighting Spirit price during the WKC 2015) took first place in the female league. The senior league (all those above the age of 17) kicked off after a short break which was devoted almost entirely to a second warm-up by the KKDH kenshi. Rapheal was up first in the first group on shiaijo B, would he be able to prove himself? He certainly did although it did not lead to him advancing to the next round. He had a very tough group, with among other the no. 2 of last and this year’s tournament. He knew it was going to be difficult but didn’t seem fazed. He went down fighting and in style. Suraya made here second appearance during this championship during the senior league. She fought without hesitation, unfortunately this pool was also just a tad too strong. Nevertheless she showed an unwavering spirit and some proper kendo which gives great promise for the future. Maurice, who’s always pitted against at least one woman nearly half his size (when you’re nearly two meters roughly half of the population is about half his size of course) fought his way through his group. With a lot less physical kendo compared to last year he was even able to score a point on the Dutch female champion. In the knockout phase of the tournament he met up with Y. Saito (yes reader, that’s a familiar name) and he suffered defeat but nevertheless did a fantastic job. Sjoerd wasn’t sure until the night before if he’d participate in the Dutch Championships. A nasty injury sustained 8 days prior left him in pain and impossible to do any form of physical activity including kendo. After some chiropractic manipulation, dry-needling and several massages he found himself looking in disbelief at the board with the draw results at the championship on Sunday morning thinking ‘F#ck, I should have stayed home’ (or as the Dutch say, the courage sank in my shoes). But with some nice and offensive fighting (if I do say so myself) he was able to advance to the next round. Next up was the Dutch female champion who was beat in encho and his winning streak continued until the quarter finals where he met Joeri. Sjoerd knew defeating Joeri was a tall order, and he proved to be a bit too tall (2m+). But what a performance, making it all the way up to the quarterfinals. The Dutch Championship was ultimately won by Jouke from Renshinjuku. Stan and Jasper’s parents were there for moral support. After all this excitement and fun we decide to grab a bite to eat. We decided on real Haute cuisine, after all, the fries were French at the McDonald’s in Soesterberg (yes, we know they have the oldest drive thru in the Netherlands). After all the waiting and fighting the food tasted delicious. 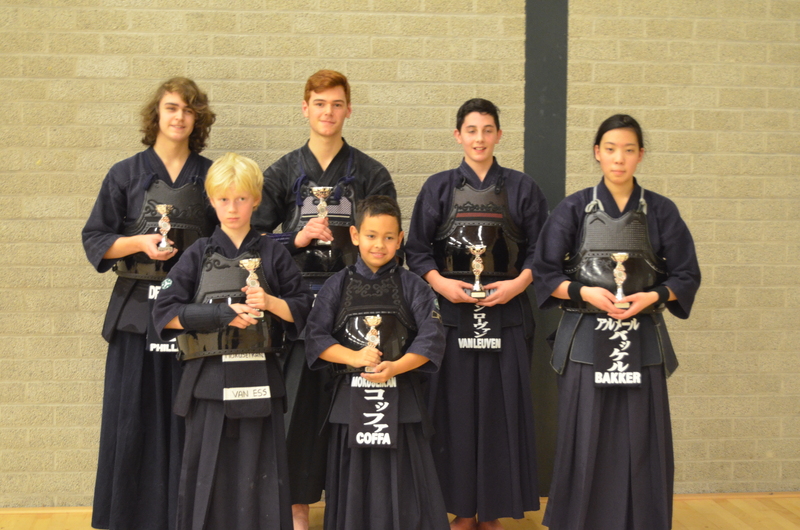 It was a very nice Dutch National Championship with first places going to kenshi from dojo Ren Bu Kan, Kendo Kai Den Haag and Renshinjuku. 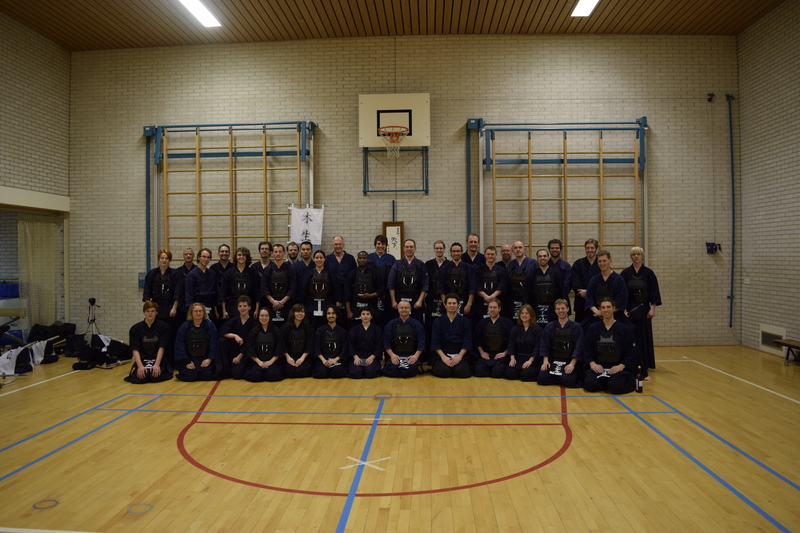 The attending group was proud of the achievements that were made by all kenshi from Kendo Kai Den Haag. We’ll be attending next year, we hope so do you! The Iijima cup was held last weekend. This two-day event was attended by over 170 kenshi from different parts of the world. Obviously Kendo Kai Den Haag was present with a number of kenshi and showed just of what we are made of. We had a number of kenshi competing in the Ikkyu division and saw some great matches. Bennie managed to come in third after a heroic battle against Hugo. Later on that day the kenshi with dan grades took up their shinai and fought with each other. The competition was fierce with a legion of national team members attending this years Iijima cup probably as part of their preparation for the World Championship later on this year in Japan. As expected none of the Kendo Kai Den Haag kenshi made it to the finals. The team championship took place on day two of the Iijima cup. After beating two teams, one of them consisting of some Polish team members we advanced to the first knockout round. Some great shiai later and we advanced once again where we unfortunately met our match against a team consisting partly out of GBR team members. We did have a lot of fun though and are looking forward to the Edo cup! The annual meeting will be held February 21st this year and a club tournament will be held directly after, giving the members an opportunity to compete against one another. You can sign up for the tournament and/or dinner by sending an e-mail to Eric or Sjoerd. You’ve all received an e-mail with the exact details and documents. On Saturday February 7th at 11:45, quite a few Kendo Kai Den Haag kenshi gathered at the dojo to set off together to Amersfoort for ‘First a Fight, Then a Bite’ with Mokuseikan. The day started well as Sjoerd and Rapheal actually were on time for a change and the whole group could leave at the scheduled time. Once we arrived we quickly put on our hakama and gi and of course put on our bogu as well. The beginners without bogu were hoisted into the clubbogu and additional Bogu Chretien brought along. After a brief explanation by Patrick (Mokuseikan) and the necessary formalities and warm up the two poules of beginners began their matches. Stan and Jasper fought well but unfortunately only Jasper advanced to the quarterfinals where he had to face Tristan. It was a beautiful match and although Jasper gave it his all Tristan prevailed and went on to the finals where he won first place. Jasper achieved a third place in his first ever shiai. 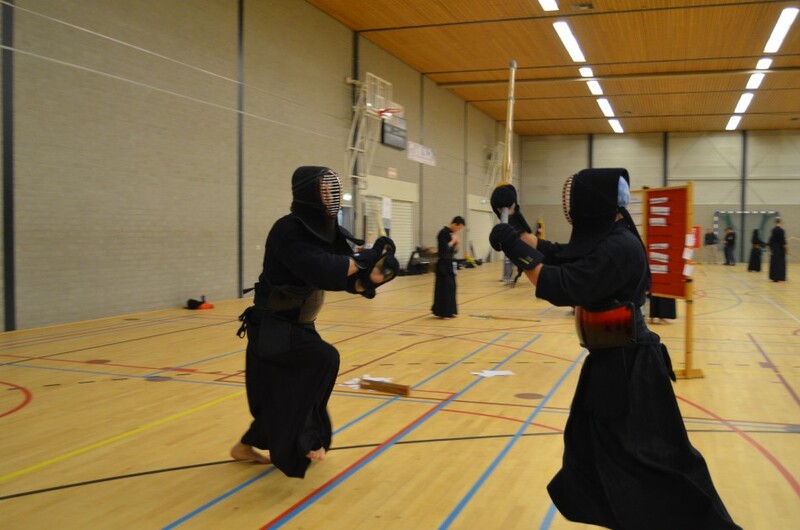 The tournament was a great way for both Kendo Kai Den Haag kenshi to experience shiai for the first time. In the other group of kenshi there were no fewer than six pools. We made use of a K&W factor. An ippon was worth less the higher ones grade is. For example, a Nidan who made an ippon got only 0.8 point, an ippon made by a 5th kyu was worth 2 points. This gave everyone a chance to fight his way to the knockout phase. The first two kenshi of the group went on anyway, the four best number threes also went through. Everyone from Kendo Kai Den Haag and Mokuseikan fought for what they were worth. We saw great fights with sometimes very surprising results. After many shiai there were 16 men, or actually 15 men and one miss who went on to the knockout stage of the tournament. After completion, the quarter-finals were held followed by the semifinals where Rapheal took on Chrétien and Sjoerd took on Rogier (Mokuseikan). They were both very exciting shiai where eventually Rapheal and Sjoerd managed to defeat their opponents. The matches were close and they both only managed to make just one valid ippon on their opponent. They both progressed to the final round. Another exciting shiai, Rapheal took the lead but Sjoerd was able to even things out by also making an ippon. After a small delay the shiai started again and Rapheal scored a debana kote and thus claimed the first place during the first ever ‘First a Fight, Then a Bite’ event between Kendo Kai Den Haag and Mokuseikan. During the presentation of the first prizes to Tristan and Rapheal the Fighting Spirit price winners were also announced. In the beginners group Stefan from Mokuseikan was the much deserved winner. 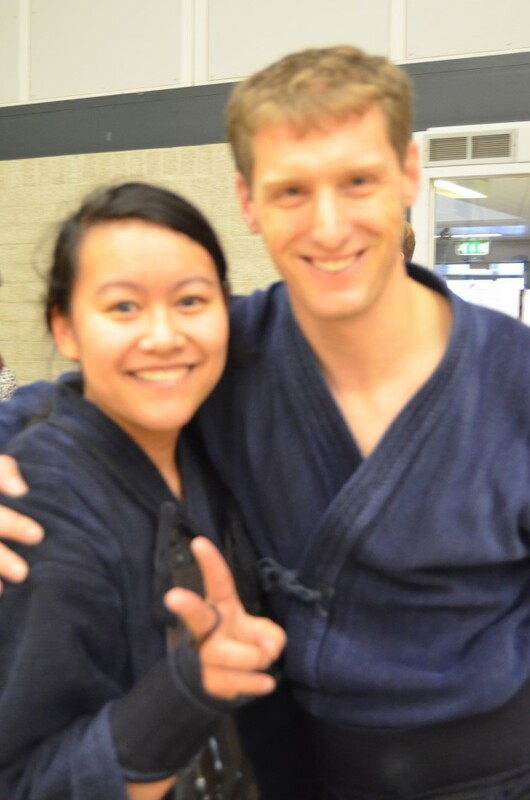 In the other group, the Fighting Spirit prize went to Ghiven from Kendo Kai Den Haag. This brought an end to the first part of the day and after having gone through the necessary formalities, the day continued in the All you can eat and drink restaurant. After a nice dinner we still had energy left to serenade Joris (KKDH), despite the fact that is was his birthday he was still present at the event. It was a very nice day with great fights, great food and a lot of new friends. For the majority of kenshi having to be a shinpan was a new and welcome experience. Mokuseikan, we’ll see you next year in The Hague for ‘First a Fight, then a Bite II’ . Not pictured but present nonetheless were Grace, Joran and Suraya who couldn’t participate because they were injured. Thank you for joining in on the fun anyway and taking pictures the whole day. Last weekend a large number of iai- and jodoka gathered in Utrecht where the Ishido Cup was held. The Ishido Cup is an annual event with seminars, competitions and exams. A significant number of members of Kendo Kai Hague were present and they’ve have achieved some great results. Baur managed to secure second place in the mudan division. Nicolas managed to achieve first place in the yondan division, extra impressive when you realize that this is his first time participating in this division. Binh took the yondan exam, and aced it! The other members put up a good fight but unfortunately missed the podium by an inch. Congratulations to you all. The full results can be found on the Facebook page of the NKR (Dutch Kendo Federation). Last Sunday national exams were held during the kendo central training. The exam was a true massacre but Bennie and Rapheal were well prepared because of the in-house exams that were held the day before and they did a terrific job. With a nice 100% score for Kendo Kai Den Haag we returned home. Bennie is now Ikkyu and Rapheal Shodan.